Fresno lies in the middle of California in the San Joaquin Valley amid some of the richest farmland in the nation. It's also home to a unique landmark built by one man. Forestiere Underground Gardens has remained in the Forestiere family for over 100 years after the creator began constructing it. Declared California Landmark No. 916, the family generously shares this jewel in the desert with the public. The following photos were used with the permission of the Forestiere family. Baldassare Forestiere left his Sicilian homeland in 1901 with a desire to escape his wealthy, domineering father and a dream to forge his own way in America. Traveling from New York to Los Angeles, he eventually landed in a place called Fresno, home to some of the richest farm land, and hottest summer weather in the nation. Intent on growing trees and vines, Forestiere purchased a parcel of land. He quickly realized the land he owned consisted of a solid plate of hardpan rock. Undeterred and desperate to escape the staggering summer heat, Forestiere changed his plans and created a remarkable underground oasis that he had intended on turning into a spa for the public. He spent 40 years chiseling out of rock a subterranean network of over a hundred niches, courtyards, patios, rooms and passageways that became his home. Little did he know that thousands of tourist would visit and marvel over his remarkable creation more than one hundred years after he began building it. 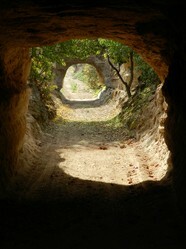 Forestiere long admired the catacombs constructed by Christians in ancient Rome. Instead of a Christian burial ground, he dug out a subterranean arboretum with well-lit courtyards, bedrooms, skylights, living rooms, a kitchen, and a chapel. A pick, shovel and wheelbarrow were his only tools. A desire to escape the infernal heat of Fresno turned into a lifelong hobby. Not only was he a self-taught engineer, architect, artist and builder but a natural horticulturist as well. In his oasis, he grew a multitude of fruit bearing plants such as oranges, grapefruits, kumquats, loquats, jujube, strawberry, quince and dates. Wine and table grapes grew throughout this fantasy land as well. Forestiere did all of this in his spare time without any plans. Like a writer without an outline, he labored everyday for forty years from the age of 22 until his death at the age of 62. He had excavated and planted 10 acres of underground land by the time he reached the age of 44, and he did it all by hand. Understandably, Forestiere preferred living in his cool underground oasis during the summer months. He insured his comfort all year long by building a summer and winter bedroom, a parlor with a fireplace, a courtyard with a bath and a well-equipped kitchen styled after early 20th century standards. The sign situated in the space that used to be his aquarium reads: "He had a table and chairs under his aquarium where he would sit and read. Looking up, he could see the fish swimming overhead." He managed the chilling winter weather by covering the skylights with glass, installing a glass door and windows and lighting the fireplace. Encircling the living quarters, he included stonework, scallop-shaped seats carved into the walls, arches, vaults and stone-built walls and passageways. Fruit producing trees, shrubs and vines were planted underground at various levels in micro climates with temperatures varying from 10 to 30 degrees. Some of these plants are over 90 years old. Fresno is my hometown. I was born and grew up there and graduated from Fresno High School. At the time, the locals referred to Forestiere Underground Gardens as Fresno Underground Gardens. Although it's privately owned, the Forestiere family generously shares it with the world. In 2010 visitors from all 50 states and 84 countries toured the gardens. Baldasarre Forestiere left his legacy to Fresno. Although it's a California landmark, when government wants something you have, they find ways to take it. The historic protections are in danger of being removed. The building of a high speed rail from Merced to Fresno is in the works. Access to this one of a kind landmark is being threatened. No matter what part of the world you live in, you can help protect this visionaries' labor of love by contacting California's state representatives and agencies. Let them know how you feel about this historical landmark. You can start with Governor Jerry Brown. If you would like to visit, Fresno Underground Gardens, you'll find it at 5021 West Shaw Avenue, Fresno, CA 93722. Hours are 10:00 A. M. to 4 P. M. Wed. through Sunday. They are closed Monday and Tuesday. Phone: 93722. Many plants require sunlight, so this has to be limiting in what can be planted. Also, I would not like to be underground in California during an earthquake. How well are the caverns supported? Forestiere was a genius and very hard working person. With perseverance he has made something that future generations will wonder at. Wow - the underground gardens is an amazing idea. The images are beautiful too. Thank you, Mike. I hope to drive more traffic there. A fascinating article, Brenda. Amazing place and a must see tourist attraction. Yes, it is a favorite tourist spot. After saffron, vanilla is the next most expensive spice. Since pure vanilla is so expensive, most vanilla flavorings and scents are made with imitation vanilla.